ne of the hottest trends in catering at the moment is food stations. They are perfect for venues that might not have room for a lot of seating or for events where you wish for your guests to enjoy great food while they mix and mingle. Your guests will also love the easy to eat items. We do not however recommend food stations for larger where all guests are seated and where there is a set time for dinner. 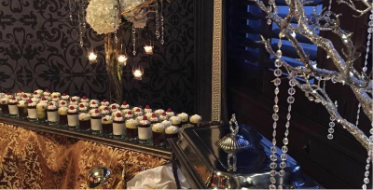 We then recommend a buffet set up but you are welcome though to incorporate station menu items into the buffet menu. Prices listed are average prices for the stations only. Each station can then always be tailored to suit your individual requests. Additional costs will also apply for such things as selected tableware, service and set up, and staffing etc, which will then be based on the details of your individual event. We pride ourselves in creating these visual displays as the center piece for your event. with crostini, pita chips and grapes. served with a roasted beet aioli. And YES, we make our own marsh mallows! Comes with, dark, milk and white chocolate and our special home-made marsh mallows. Our marsh mallow bar is set up with camp fire logs, wooden skewers and display accessories. Choose one or a variety of selected desserts served in 5oz shooter glasses.